Looking for Metro Feeder Buses Advertising in Delhi? The definition of Metro Feeder Bus Advertising is advertising displays placed inside and outside of Metro Feeder Buses, which include partial and full wraps. Metro Feeder Buses advertisements and ad on Metro Feeder Buses options are available in almost every market across Delhi NCR India. 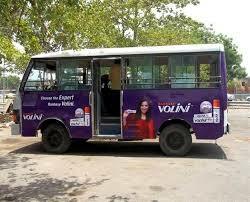 The main aim of the Metro Feeder Bus Advertising Agency Delhi NCR in India is to create “unforgettable” ads. In order to do this the advertising agency has to take into consideration several factors, like unusualness of the location, content of the message, its co-relation to the location.